This is one of our BK vacations in the early 70s’. 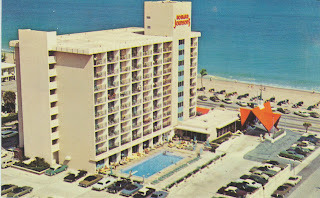 Then, this Howard Johnson’s Motor Lodge was the latest state of the art kind of motor lodge. We were on the top floor, across the street from the beach and had a grand view of the Fort Lauderdale Beach and the ocean. Connie Francis starred in “Where the Boys Are” in a movie about and named Fort Lauderdale. If the Howard Johnson building is still there it is probably a community eye sore. I remember just across the side street was an great restaurant that had that Hawaiian luau decor that served great fish dishes. I expected to see Moon Doggie make a grand entrance. And what a treat it was to go to Hard Johnsons to eat. In those good old days. What a great beach - I lived there in 1980 and then again for a while in 1982. My sister-in-law and I worked at the Galt Ocean Mile Hotel. It was great for a while - but I got homesick, missing the hills and mountains, and folks who eat grits for breakfast. I saw the movie, "Where the Boys Are", a long time ago. Connie Francis has a great voice - I heard her sing the movie title on oldies a few weeks ago. Wasn't HJ the first one to introduce a big number of flavors of ice cream? The beech was ok but I think the water might have had too much seaweed in it to be enjoyable. Or was that Miami Beach or a beach near Tampa? We visited all three places that year. It was probably the west coast (Tampa). The last time Mom, Connie, and I went to Panama City, the ocean was full of sea weed - it was terrible. I think this is a regular occurance a few times a year on the Emerald Coast. Of course the east coast has sea weed too, but imo, it is worse on the west coast. Now that you mention it, I think it was the Gulf side, but maybe not Tampa, however, when we saw Tampa Bay it was red... some kind of red algae took over... it happens every once in a while, a local person said. Deborah - did you read my blog four or five days ago that I went back to the covered bridge and looked for the cemetery?